A Year of Being Here: K. Schippers: "Black"
all meaning has slipped away. 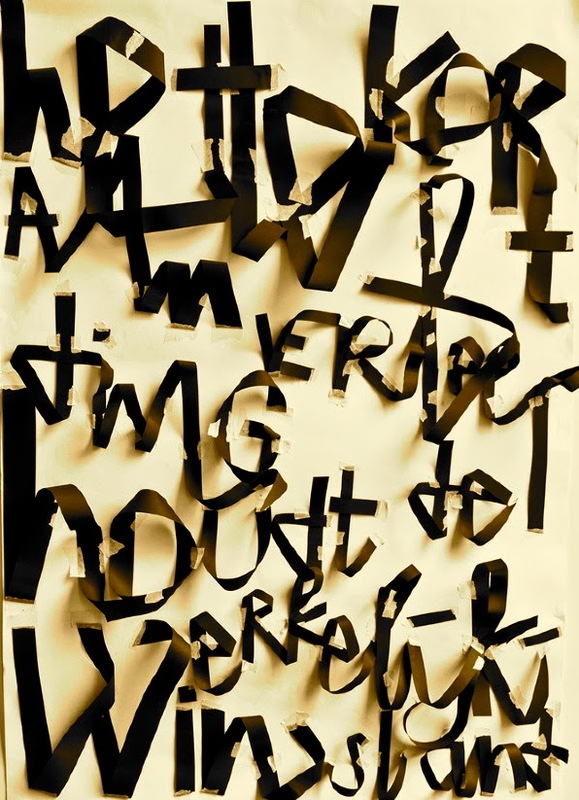 "Black" ("Zwart") by K. Schippers, from Buiten Beeld ("Off-Screen"). © CPNB, 2014. Translation from the Dutch by David Colmer © 2014. Posted here as published on Poetry International, 2014. Image credit: Detail from "Schippers," a "2 hour poster project visualizing the given sentence 'Het tekort aan verbeelding houdt de werkelijkheid in stand' (`The shortage of imagination upholds reality') from Dutch poet K. Schippers," by Rozemarijn Hooij. Explained by the artist as "3D Typography made out of paper strokes." Exhibited at the Graphic Design Congress at the World Expo, Shanghai, China, 2010 (originally color).